Aliases Volume 3: Wonder World. Where Chaos & Love Rains! 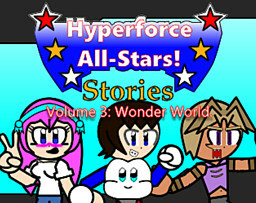 Hyperforce All-Stars! J5 and Marik go out to find this weird relic located in one of the Pyramids that are on Bedandera. Once J5 and Marik find it, Bedandera's citizens start acting a little strange, driving J5 to insanity. But afterwards, Sakura seems to encounter this strange phenomenon too. You won't want to miss this adventure full of mystery and shipping!